House Speaker John Boehner has said he again will insist there be more spending cuts and reforms than any debt ceiling increase. NEW YORK (CNNMoney) -- Wow. So here we are again. Washington is spoiling for a fight over the country's debt ceiling -- less than a year after a showdown that induced a credit downgrade, rocked the markets and eroded confidence in Congress. Last week, House Speaker John Boehner said he would not permit another increase in the country's legal borrowing limit without a larger amount of spending cuts and reforms approved in tandem. "I suspect blood pressure readings went up [that] afternoon," said budget expert Joe Minarik, senior vice president of the Committee for Economic Development. That would be understandable given how damaging the last debt ceiling showdown turned out to be. But we'll get to that in a minute. First, it pays to remember just how the debt ceiling actually works. What is the debt ceiling exactly? It's a legal cap set by Congress on the amount of money the federal government can borrow. The ceiling applies to debt owed to the public (i.e., anyone who buys U.S. bonds) plus debt owed to federal government trust funds such as those for Social Security and Medicare. The first limit, established in 1917, was set at $11.5 billion, according to the Committee for a Responsible Federal Budget. By setting a limit, Congress gave the Treasury Department authority to borrow money as needed. Previously, Congress had to sign off every time the federal government issued debt. When will we hit it? Treasury Secretary Tim Geithner has said he estimates that U.S. borrowing could hit the debt ceiling by the end of 2012. But by taking "extraordinary measures" -- such as suspending investments in federal retirement funds -- Geithner might be able to buy enough time to keep borrowing below the legal limit until early 2013. How is the ceiling determined? They never admit it, but every time lawmakers vote to hike spending or cut taxes and not pay for them, they're tacitly acknowledging that the debt ceiling will need to raised in the future. So arguing over the debt ceiling after the fact is essentially arguing over whether to pay the bills the country has already incurred and which Congress has already approved. How many times has the ceiling been raised? Since March 1962, debt ceiling increases have been enacted 76 times, according to the Congressional Research Service. Congress has voted to raise the ceiling 11 of those times since 2001. Expect more of the same over the next decade. Barring major changes to spending and tax policies, "Congress would repeatedly face demands to raise the debt limit," CRS wrote. Why does Congress even bother to set a debt limit? In theory, the limit is supposed to help Congress control spending. In reality, it doesn't. Every time the debt limit needs to be raised, lawmakers and the president are forced to take stock of the country's fiscal direction, which in theory isn't a bad thing. But the decision about how high to set the ceiling is usually a political one -- depending on how quickly the minority party wants to raise the issue again for political gain or to extract concessions. In any case, the vote usually comes after lawmakers have already passed the spending hikes and tax cuts that necessitate an increase in the first place. What happens if Congress doesn't raise the debt ceiling? Treasury would not be able to borrow any more money. That means the government would fall short of what it needs to pay all its bills in full, which include funding government operations and paying creditors and contractors. During last year's debate, Geithner's critics said he could prevent default by simply paying the interest due to bondholders. But since average spending -- minus interest -- outpaces revenue by about $115 billion a month, Geithner would have to pick and choose whom to pay and whom to put off every day. And there's no guarantee that paying interest while shirking other legal obligations will protect the country from the perception of default. Geithner said it would be akin to a homeowner who pays his mortgage but puts off his car loan and credit cards. Translation: the homeowner's credit could still be damaged. Ultimately, if lawmakers fail to raise the ceiling, they will have two choices, both awful. They could immediately enact massive spending cuts or tax increases. Or they could acknowledge that the country would be unable to pay what it owes in full and the United States could effectively default on some of its obligations. The first option is impossible to execute without serious economic repercussions. And the second option could cripple the economy and send world markets into a tailspin. "Not only the default but efforts to resolve it would arguably have negative repercussions on both domestic and international financial markets and economies," according to the CRS. 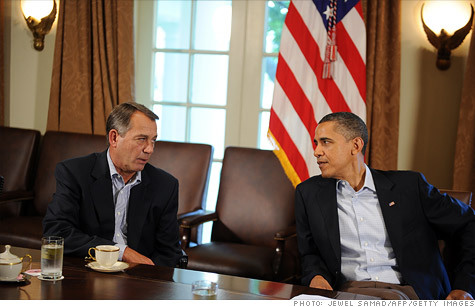 Will reaching the debt ceiling cause a government shutdown? Technically, no. By contrast, if the debt ceiling is breached, Uncle Sam would still have revenue coming in that could be used to fund the government, noted Rudolph Penner, a former Congressional Budget Office director. But if Geithner is coming up short by $115 billion on average every month, and lawmakers just decide to cut spending by that amount, that could effectively mean a partial government shutdown. So what happened last year? The 2011 debt ceiling showdown resulted in a three-part increase to the debt ceiling in exchange for, among other things, at least $2.1 trillion in debt reduction over 10 years. The debt ceiling deal -- known as the Budget Control Act -- also empowered a so-called super committee of lawmakers from both parties to negotiate how to achieve at least $1.2 trillion of that debt reduction. That committee failed, however, thereby triggering a sequester of nearly $1 trillion in automatic spending cuts, mostly across defense and nondefense discretionary spending. That latter category pays for many common and popular governmental functions, from food inspections to the operation of national parks. Those cuts are set to start taking effect in January 2013. Many lawmakers hate those cuts-- but apparently not enough yet to negotiate a bipartisan deal to replace them. The debt ceiling showdown of 2011 also created a lot of bad blood between the parties and between Republicans and the White House. And it sparked the first-ever downgrade of the U.S. credit rating by Standard & Poor's, which cited political brinksmanship as the chief cause. That, in turn, caused one of the most volatile weeks in world markets and left Americans and investors with the sense that Congress can't handle even the most elemental tasks without a lot of destructive drama.